After years and years of talking about it, you’ve fiiiiiinally booked those Air New Zealand flights to Buenos Aires and your South American dream is about to come true. Before you head anywhere else, you need to spend at least one week in Buenos Aires. So you know exactly what to drink, eat, see and do, we’ve teamed up with the Air New Zealand crew, who know everything there is to know about one of the best cities in the world. As you can see on the map, there's a whole lot to do, so start planning people! If there’s one thing Argentina is known for, it’s steak. 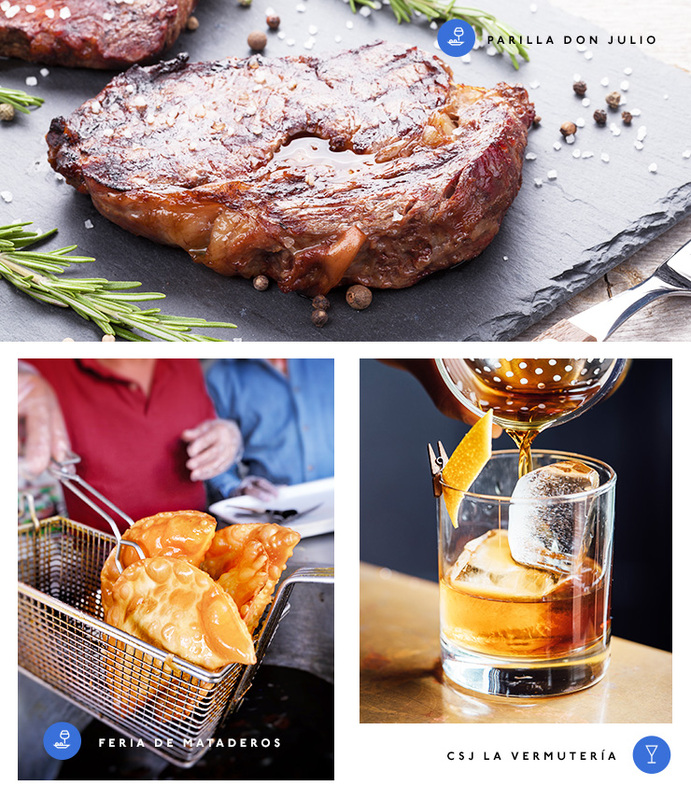 Serving up every cut of beef you could dream of, Don Julio is one of the best damn steakhouses in town. With white tablecloths, an impressive wine list and super rustic vibes, there’s nowhere better to get your protein fix. Locals swarm here for the ojo de bife (rib-eye steak) and cuadril (rump steak) but make sure you wrap your lips around the bife de chorizo as well—it's juicy and succulent in all the right ways. The Feria de Mataderos (aka The Mataderos Street Fair) is a must for any foodie. Located on the outskirts of Buenos Aires, these Sunday markets are unlike any others, with Gauchos (aka cowboys), dancing, music and allllll of the food. Stuff yourself silly with every Argentinean delicacy you can, from empanadas and choris (think grilled chorizo sandwich) to dulce de leche (think caramel on a stick), and don’t forget your stretchiest stretchy pants. Pizza is surprisingly popular in Argentina due to the large influx of Italian immigrants way back when. But it’s not pizza as we know it. It’s more like thick, doughy, deep dish pizza, overloaded with cheese and sold by the slice. No one does it better than Pizzeria Güerrin so make sure you make your way here at one point and order one of everything. Apparently, the wood fire oven hasn’t been turned off since 1932... just sayin'. As you would expect in a country known for its meat, the burgers from Buenos Aires do not disappoint. Our pick is Burger Joint in Palermo Soho, famous for dishing up four simple burgers that are all jam-packed with super soft and juicy beef. If you like your burger with a side of spice, order the Mexican with jalapeños, guacamole, tomato, cheese, caramelised onion and hot sauce. Trust us. Frank’s takes the whole hidden bar craze to a totally new level, with entry only granted after two tests. Firstly, you need to get past the doorman (that’s the easy part) then once you enter a smaller room you need to enter a secret code into a telephone, which will open the door to the bar (that’s the tricky part). We’re not telling you where to find the code but let’s just say once you get inside, the search will be well worth it. Head back in time and expect the unexpected at Sr. Duncan, where it’s about theatre, dance and music. Tucked away in Art Nouveau building in Almagro, the popcorn is free flowing and the drinks are cheap. Depending on what night you go in, there could be a live comedy show, jazz orchestra, swing band and more. The only thing better than a tapas bar, is a tapas and vermouth bar, which is exactly why you need to pay CSJ La Vermuteria in San Telmo a visit. With only twelve seats and standing room for not many more, this super small bar serves up tasty grilled tapas and house made vermouth on tap. Just think of the Negronis. As soon as you set foot in Milion, you’ll never want to leave. Housed in an old mansion in Recoleta, with a grand marble staircase that will look fab on your Instagram, this luxe bar is where you need to go if you want cocktails and more cocktails. Order a caipirinha (or three) and make the most of the people watching. 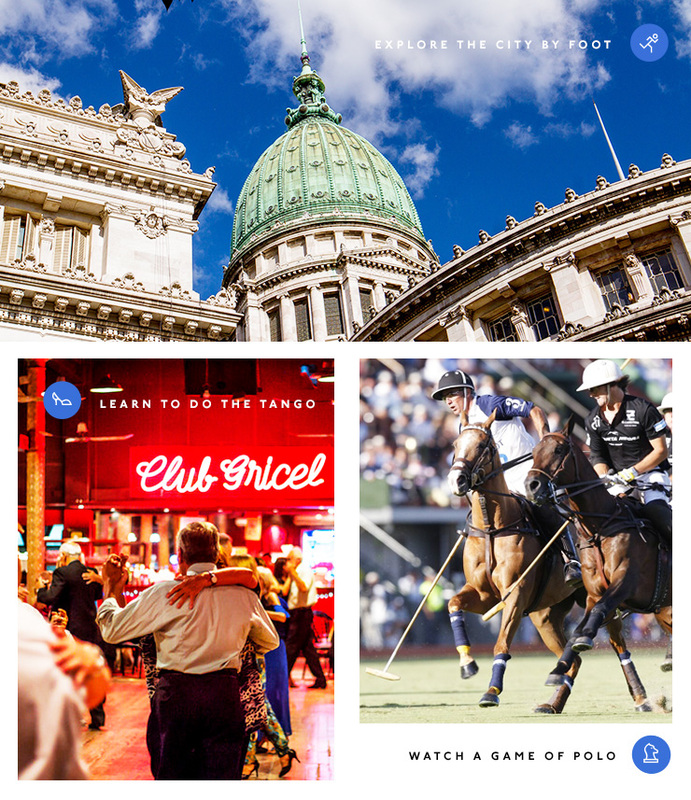 The best way to see all that Buenos Aires has to offer is to get involved with one of the many walking tours (BA Turismo is our fave!). Make your way through the colourful La Boca, explore the neighbourhoods of Recoleta and learn the history of this South American city that looks European. If you're lucky, you'll see grand churches like the Basilica de Nuestra Senora Del Pilar, the magnificent Teatro Colon (one of the most famous theatres in the world) and plenty of old school architecture that you just don't see in Australia. Frock or suit up and head to a polo game along with the city’s most glamorous. Do as the locals do and take a punt, while sipping on champagne and watching some of the country's best polo players in action at the Campo Argentino de Polo en Palermo. Hot tip: Post-match follow the crowds to the exclusive clubs only the locals know about for a fiesta like no other. With cobblestone tree-lined streets filled with up and coming designers and artists, Palermo is the place to go if you want to shop ‘til you drop. From fashion and art to ceramics and furniture, this hipster neighbourhood will keep you busy for hours. You can’t go all the way to South America and not learn how to dance the tango. Book yourself into a group or private class at Club Gricel and impress yourself with moves you didn’t know you had. Buenos Aires is so close to Uruguay that you’d be silly not to get the 2-hour ferry over to the historical Colonial del Sacramento for a day. Not only will you earn yourself another stamp in your passport, you’ll get to explore the streets of this charming town with old cars, flower filled balconies and plenty of views. Home Hotel is an Instagrammer’s paradise. Styled to perfection with minimalist colours and vintage wallpaper, the trendy rooms are beyond chic and the pool is the only place you’ll want to unwind after a tough day of exploring. Best for a couple, so you can split the price of the room, there's a whole heap of restaurants and bars nearby so you can roll into bed when your food coma hits. If you’re going to go all out, go all out at Belle Époque Alvear Palace Hotel. The luxury hotel is famous for a reason, with all things gold and velvet adorning the walls and crystal chandeliers hanging from the ceiling. Treat yourself to a recently added rooftop room for one of the best views in the city. If you’re on a budget but still want to stay somewhere modern that’s not a hostel, make Lemon Apartments your go-to. Smack bang in the centre of San Telmo, these boutique apartments are perfect for two and have all the right necessities as well as a cool, laid-back bar and pool. Editor's note: This article is proudly sponsored by Air New Zealand and endorsed by The Urban List. Thank you for supporting the sponsors who make The Urban List possible. Click here for more information on our editorial policy.